The United States Department of the Energy (U.S. DOE) Washington River Protection Solutions LLC recently issued an Expressions of Interest (EOI) from contractors capable of providing a supplemental organic treatment system for one the 200 Area effluent treatment facility (ETF) at the Hanford Superfund Site. The Hanford Site is a decommissioned nuclear production complex operated by the United States federal government on the Columbia River in Benton County in the U.S. state of Washington. The main treatment train at ETF currently eliminates the hazardous characteristics of the waste and allows for delisting the effluent. Beginning around January 2022, the ETF will receive a new wastewater stream that will be generated nearly continuously for a period of ~40 years and is anticipated to contain at least four organic constituents-acetonitrile, acrylonitrile, acetone, and methylene chloride-in concentrations that exceed the expected performance range for the existing system. Input is requested from Industry to enable an evaluation of an off-the-shelf procurement and a procurement/design activities solution to meet the future requirement. Expressions of interest are due by 9:00 AM PT on May 6, 2019. Established in 1943 as part of the U.S. Manhattan Project in Hanford, south-central Washington, the site was home to the B Reactor, the first full-scale plutonium production reactor in the world. Most of the reactors were shut down between 1964 and 1971. The last reactor at the Hanford site operated until 1987. Since then, most of the Hanford reactors have been entombed (“cocooned”) to allow the radioactive materials to decay, and the surrounding structures have been removed and buried. In 1989, the State of Washington (Dept. of Ecology), the U.S. Environmental Protection Agency (EPA), and the U.S. Department of Energy (DOE) entered into the Tri-Party Agreement which sets targets, or milestones, for cleanup. The U.S. EPA and State of Washington Dept. of Ecology share regulatory oversight based on Comprehensive Environmental Response, Compensation, and Liability Act (CERCLA, also referred to as Superfund) and the Resource Conservation and Recovery Act (RCRA). The U.S. Department of Energy (DOE) Office of River Protection (ORP) operates the 200 Area ETF. 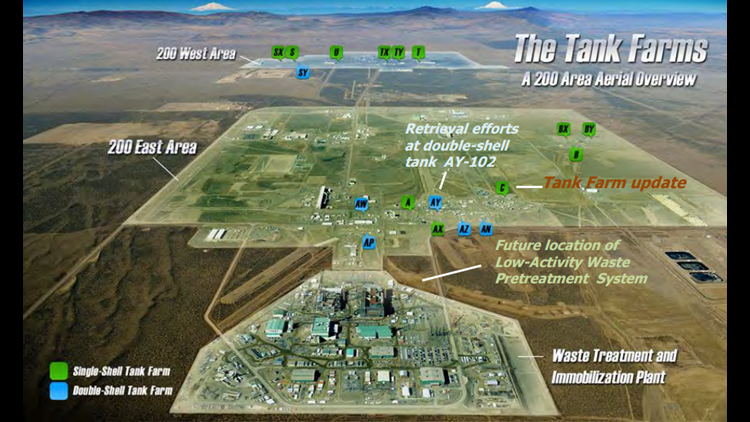 The ETF has been treating wastewaters from processing activities at the Hanford Site since 1994. The main treatment train at ETF includes, in order: pH adjustment; coarse filtration; ultraviolet/hydrogen peroxide oxidation (UV/OX); pH adjustment; excess peroxide decomposition; degasification; fine filtration; reverse osmosis (RO); and, ion exchange (IX). To date, $15 billion (U.S.) has been spent on clean-up efforts at the Hanford site. In 2014, the estimated cost of the remaining Hanford clean was $113.6 billion (U.S.). Clean-up was estimated to occur until 2046. There are over 10,000 workers on site to consolidate, clean up, and mitigate waste, contaminated buildings, and contaminated soil. 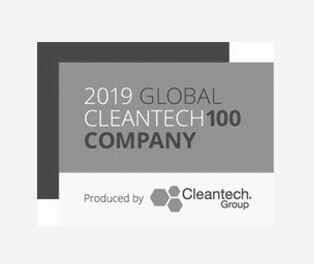 dynaCERT Inc and H2 Tek have taken home the $5,000 top prize at the Mining Cleantech Challenge in Denver, the Colorado Cleantech Industries Association (CCIA) has reported. The two companies’ technology were chosen by mining executives and investors in the industry as the best among a competitive field of 12 total companies representing the US, Canada and Israel, the CCIA said. An international team of judges reviewed and voted on the winners, the CCIA said. dynaCERT’s HydraGEN™ turns distilled water into H2 and O2 gases on-demand and introduces these gases directly to diesel engines’ air intakes. H2 Tek Vice President of Sales and Marketing, David Van Klaveren, said: “Our technology, HydraGEN can actually improve significantly those carbon emissions, reduce them and, along the way, pay for the capital cost of all this through fuel efficiency savings. Hydrocarbons and CO2 are reduced due to the absence of carbon in hydrogen fuel and also due to better combustion of diesel fuel with the aid of hydrogen which has a higher flame speed, dynaCERT said. Second place in the cleantech competition went to Earth Alive Clean Technologies, a microbial dust control technology that is non-hazmat, 100% organic and has biodegradable properties. Earth Alive offers EA1TM dust suppressant and RapidAll cleaner to remove dust, dirt and any other contaminant in a natural way. EA1 eliminates 90% of dust on work sites. EA1TM reduces dust through the use of microbial technology to keep dust particles in the soil. EA1TM reintroduces natural microbial strains compounds already found in nature into the ground to create conditions that prevent dust from becoming airborne, while helping to retain soil moisture. Microbial spores are activated after application and thrive in the soil binding soil particles and creating a firm and resistant layer preventing dust emission. There is increasing focus on the utilization of Blockchain technology to track hazardous materials and hazardous waste. Blockchain technology allows for a system where records can be stored, facts can be verified by anyone, and security is guaranteed. The software that would power such a system is called a “blockchain”. Blockchains store information across a network of computers making them both decentralized and distributed. This means no central company or person owns the system and that everyone can use it and help run it. This makes it extremely difficult for any one person to take down the network or corrupt it. In essence, a blockchain is a super-secure digital ledger, where transactions records are kept chronologically and publicly. According to experts, the technology would also make it easier to track shipments of hazardous materials and waste. It could even help with regulatory compliance. The management of hazardous materials/waste through blockchain would result in more open and coordinated movement among generators, transporters, users, and and recyclers. It would also enable the government to more efficiently and openly regulate hazardous materials movement and hazardous waste management. The imbalance between the organized and unorganized sectors would shrink and lead to increased transparency throughout the process. The technology that powers cryptocurrencies like bitcoin are slowly making way into hazardous materials transportation and hazardous waste management. As reported in Hacker Noon, Jody Cleworth, the CEO of Marine Transport International said, “The shipping of recovered materials is necessarily heavily regulated, and we’ve had a real impact in simplifying the process while remaining compliant.” Marine Transport International is a New Jersey-based freight forwarder. The company just completed a successful blockchain pilot. This pilot created a common tracking system linking up recycling suppliers, port operators, and ocean carriers. Phil Rudoni, Chief Tech Officer at Rubicon said that “A big issue the waste industry faces is the lack of accountability for the end destination of recycled material. Rubicon is an Atlanta-based tech startup that provides cloud-based recycling and waste services. It has always been a challenge to track hazardous materials and waste. With blockchain, it is believed that it would be much easier. It wouldn’t be so difficult to design a system where hazardous materials could be tagged with scannable Quick Response or QR-Codes (two-dimensional barcode) and then tracked at each step of the recycling supply chain. The tracking could be done by the generator, regulator, receiver, the general public, and any other interested person. The Several waste initiatives have seen the potential of incorporating blockchain technology. One if such initiative is the Plastic Bank, a global recycling venture founded in Vancouver by David Katz and Shaun Frankson. Its main aim is to reduce plastic waste in developing countries like Haiti, Peru, Colombia, and the Philippines. It has plans to extend it’s territory this year. The Plastic Bank initiative pays people who bring plastic rubbish to bank recycling centers. One payment option is the use of blockchain-secured digital tokens. The tokens can be used to purchase things like food or phone-charging units in any store using the Plastic Bank app. The plastic brought into the Plastic Bank is bought by companies and recycled into new consumer products. This system is more attractive because blockchain’s transparency means all parties can see and monitor where their effort and/or investment goes. Written by Paul R. Pickering, Aeroqual Ltd.
As New York City’s need for space grows, existing stock of land must be used more effectively. Brownfield cleanup and redevelopment represents one of the best opportunities to engage communities and reclaim land for development in many cities. In 2018, the Mayor’s Office of Environmental Remediation (MOER) announced 1000×21, the most aggressive land cleanup and revitalization goal of any city in the world. This OneNYCinitiative seeks to remediate and redevelop 1,000 lots in NYC by the end of the de Blasio administration in 2021. Any time a remediation or construction project involves earth-moving, it has the potential to release particulate (dust) and volatile organic compounds (VOCs) contaminants that exist below the surface. VOCs will readily transition to the gaseous, breathable phase, when exposed to air. Particulate emissions must be controlled to prevent impacts to the respiratory system. Negative impacts range from mild lung irritation to chronic lung disease. To protect workers and the surrounding community, construction and demolition projects that involve excavation need to follow a stringent Community Air Monitoring Plan(CAMP), as specified by the New York State Department of Health (NYSDOH). If the excavation activities are occurring on a remediation or cleanup site, additional requirements are outlined in a guidance document known as DER-10. NYSDOH and DER-10 specifically apply to sites in New York. However, agencies and authorities in other states may also recognize these guidelines. They have been known to apply or refer to them for projects in their designated territories. In 2010, the New York State Department of Environmental Conservation (NYSDEC) issued Division of Environmental Remediation (DER)-10 Technical Guidance for Site Investigation and Remediation, known as DER-10. This is the source document the NYSDEC refer to for authority to oversee remediation projects. It was designed to help parties and consultants (environmental and engineering) in developing and implementing investigation and remediation projects at contaminated sites. DER-10 extensively (over 225 pages) describes the A to Z requirements for remedial site investigations, cleanups, post-cleanup monitoring and site closure. It presents detailed technical guidance for each of the investigative and remedial steps undertaken at contaminated sites. DER-10 covers procedures for assessing the environmental conditions at the site, including air monitoring during remediation activities. Appendix 1A of the DER-10 outlines requirements for the implementation of a CAMP. This air monitoring plan is prescribed by NYSDOH. It involves direct-reading air monitoring instruments placed at defined locations around the perimeter of a remediation, construction or demolition site. A CAMP requires real-time air monitoring for total VOCs (also referred to as total organic vapors) and PM10 (particulate matter 10 micrometers or less in diameter) at downwind and upwind locations relative to each designated work area when certain activities are in progress at contaminated sites. The CAMP is not intended for use in establishing action levels for worker respiratory protection. Rather, it is intended to protect the downwind community) from potential airborne contaminants released as a direct result of investigative and remedial work activities. The downwind community includes off-site receptors such as residences, businesses, and on-site workers not directly involved with the subject work activities. The specified CAMP action levels require increased monitoring, corrective actions to abate emissions, and/or work shutdown. Additionally, the CAMP helps to confirm that work activities did not spread contamination off-site through the air. Basic requirements of a CAMP call for real-time air monitoring for VOCs and/or particulate levels at the perimeter of the exclusion zone, or work area. Sites known to be contaminated with heavy metals alone may only require particulate monitoring. If radiological contamination is a concern, additional monitoring requirements may be necessary in consultation with NYSDEC and NYSDOH. 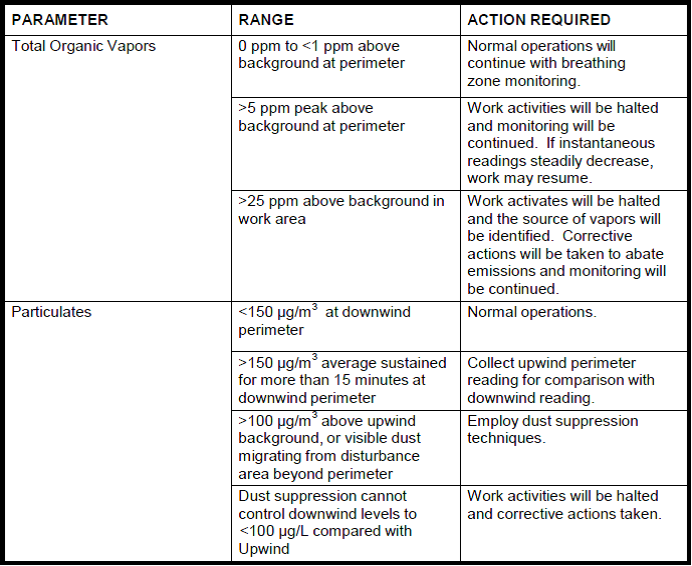 The table below summarizes CAMP Monitoring Action Levels for total VOC and particulate monitoring. Assembled kits, like this Basic Environmental Dust Monitoring Kit from Raeco Rents, are portable and suited to short-term or temporary CAMP. The ensemble includes an off-the-shelf dust monitor, handheld PID monitor for total VOCs, and a cloud-based telemetry system mounted in an environmental enclosure. All-in-one air quality monitors, like the AQS1 and the Dust Sentry from Aeroqual, are highly flexible and defensible, as well as good allrounders for short or long-term CAMP. In addition to the primary particulate fraction PM10, these monitors can also measure PM2.5, PM1 and Total PM. They can also be configured for monitoring total VOCs and NO2 emissions from remediation and construction sites. A robust light-scattering Nephelometer with sharp cut cyclone is integrated with a PID-based VOC analyzer module (or GSE-based NO2 gas module), Cloud telemetry platform, air quality software, and optional plug-and-play weather and noise sensors. Trigger alerts are programmable for SMS and email notifications, or can be used to activate an external VOC canister sample collection for speciated analysis according to EPA Method TO-15. Perimeter air monitoring stations, like the AirLogics Classic 2, contain analytical, climatic, and communications instrumentation. This equipment includes: a gas chromatograph (GC) to measure specific VOCs, a respirable particulate meter to measure dust levels, shelter heaters and air conditioners, and a radio-based data acquisition system. These systems were originally developed for use in the cleanup of former manufactured gas plant (MGP) sites. DER-10 guidelines require daily measurement of wind speed and direction, temperature, barometric pressure, and relative humidity, to establish background weather conditions. Wind direction data is used to position the air monitoring equipment in appropriate upwind and downwind locations. The evaluation of weather conditions is also necessary for proper fugitive dust control. When extreme wind conditions make dust control ineffective, remedial actions may need to be suspended. There may be situations that require fugitive dust suppression and particulate monitoring requirements with more stringent action levels. Under some circumstances, the contaminant concentration and/or toxicity may require additional monitoring to protect site personnel and the community. Additional integrated sampling and chemical analysis of the dust may be required. This must be evaluated when a Health and Safety Plan (HASP), is developed. Appropriate suppression and monitoring requirements are established for protection of people’s health and the environment. All recorded monitoring data is downloaded and field logged daily, including Action Limit Reports (if any) and daily CAMP monitoring location plans. Records are required to be maintained onsite for NYSDEC and NYSDOH to review. A description of the CAMP-related activities is also included in a monthly progress report submitted to the NYSDEC. The overall report submitted to the NYSDEC should include all CAMP monitoring records. If site works are stopped due to inability to control fugitive emissions to below the action limit, the NYSDEC is to be notified within twenty-four hours of the work stoppage. For a real-life example of air monitoring at a remediation site please read my blog about the pilot cleanup of the Gowanus Canal, NY. What CAMP solutions does Aeroqual offer? Aeroqual’s Dust Sentry and AQS1 are flexible air monitoring platforms used by air quality professionals, and environmental and geotechnical consultants, for community air monitoring plans on remediation sites. We help environmental consultants deliver defensible data on projects by providing cost-effective and reliable instrumentation. For insights on the latest air monitoring trends at construction sites please read our blog about measuring NO2 and multiple PM fractions. Paul R. Pickering is the Business Development Director at Aeroqual Ltd., and is located in Auckland, New Zealand. Aeroqual Ltd. is a company that delivers innovative air quality and environmental monitoring solutions. He is passionate about making it easier to measure the air with advanced sensor-based technology. He believes that more relevant information about our environment can help us make better informed decisions, enjoy better quality of life, and make our planet a better home. A Purdue University team, led by Joe Sinfield, an associate professor in Purdue’s Lyles School of Civil Engineering, and involving former Purdue researcher Chike Monwuba, has developed a new method to detect the presence of these hazardous solvents in water and soil. The method offers the potential to enhance monitoring operations and improve the efficiency of remediation efforts. “Our method is accurate, quick and can detect very low concentrations of the target contaminants,” said Sinfield, who also serves as the director of Purdue’s College of Engineering Innovation and Leadership Studies Program. The Purdue team had initially focused on using Raman spectroscopy to directly detect chlorinated solvents. In this approach, a laser is used to examine a sample and the scattered light is observed to determine its chemical makeup. This observation led to the development of a sensing mechanism that is nearly 10 times more sensitive than conventional approaches involving direct observation of the solvents themselves. Sinfield said the Purdue method also shows promise for detecting chlorine based compounds in other contexts, as well as chemicals such as fluorine, bromine or iodine in an array of application spaces. The work aligns with Purdue’s Giant Leaps celebration, celebrating the university’s global advancements in health and sustainability as part of Purdue’s 150th anniversary. These are two of the four themes of the yearlong celebration’s Ideas Festival, designed to showcase Purdue as an intellectual center solving real-world issues. Researchers worked with the Purdue Office of Technology Commercialization to patent the innovation, and they are looking for partners to continue developing it. The Government of Canada recently announced that $17 million would be made available for small-to-medium enterprise (SME) echnology companies (including Cleantech) to assist in exports. The $17 million will be used to expand the successful Canadian Technology Accelerator (CTA) program and will be distributed to eligible companies over a five year period. The Canadian Technology Accelerator (CTA) is a program of the Canadian Global Affairs Canada’s Trade Commissioner Service. It offers high-intensity programming that helps selected high-growth, high-potential Canadian technology firms scale up by connecting them with export, investment and partnership opportunities in global innovation centres. Over the course of a four- to six-month program, CTA participants are provided with tailored support ranging from in-market working space and coaching to market validation and introductions to potential partners, clients and investors. Since 2013, the CTA program has helped over 500 Canadian technology companies accelerate their growth by gaining a foothold in key U.S. innovation centres. Since 2013, the program has achieved notable success in Boston, New York and San Francisco. An investment of $2 million a year has been leveraged into $510 million in capital raised, $190 million in new revenue, 996 strategic partnerships and 2,125 new jobs for 489 high-growth, high-potential firms in key technology sectors, such as information and communications technology, life sciences and clean-tech. Axine Water Technologies – Created a new standard for treating toxic organic pollutants in industrial wastewater, solving a global problem for pharmaceutical, chemical and other manufacturing industries. Vancouver, B.C. 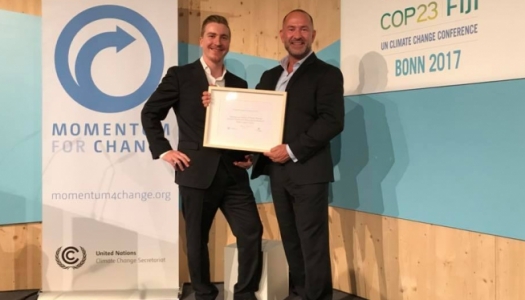 CarbonCure – Retrofits concrete industry plants with a technology that recycles waste carbon dioxide to make affordable, greener concrete products. Halifax, N.S. Cooledge Lighting – Provides adaptable LED lighting solutions to help the design industry integrate light into the built environment. Richmond, B.C. ecobee – Empowers people to transform their lives, homes, communities and planet through innovative technologies that are accessible and affordable. In 2007, ecobee introduced the world’s first smart Wi-Fi thermostat to help millions of people save energy and money without compromising comfort. Toronto, Ont. Enbala – Provides the advanced technology needed to ensure the operational stability of the world’s power grids by harnessing the power of distributed energy. Vancouver, B.C. GaN Systems – Manufactures a range of highly efficient transistors that address the needs of various industries, including renewable energy systems, data centre servers, automotive systems, industrial motors and consumer electronics. Ottawa, Ont. Inventys – Commercializes a low-cost and energy efficient technology for capturing post-combustion CO₂ from various sources, such as natural gas boilers, gas turbines, and industrial facilities, such as cement plants. Burnaby, B.C. Metamaterials Technologies – Develops smart materials and photonics to provide solutions in the field of optics for several industries, including aerospace and defence, healthcare, energy, education, and cleantech. Dartmouth, N.S. MineSense Technologies – Improves the ore extraction and recovery process to significantly increase profitability and decrease requirements for energy, water and chemicals. Vancouver, B.C. Opus One Solutions – Developed GridOS®, an intelligent data analytical platform for smart grids that delivers optimal energy planning and management to generate, distribute, store and consume energy in a distributed network, paving the way toward a distributed energy economy. Toronto, Ont. Semios -Develops agricultural technology innovation involving precision agriculture, biological pest control and data management. Vancouver, B.C. Terramera – Uses technology to replace synthetic chemical pesticides with high-performance, plant-based pest control products for agricultural and consumer use. Vancouver, B.C. The cleantech global market is estimated to be worth US$1 trillion and expected to surpass the US $2.5 trillion by 2022. The additional $17 million in funding will allow the expansion of CTA programming to global innovation centres: Berlin, Delhi, London and Mexico City. This builds upon the recent expansion of the CTA to four Asian cities (Hong Kong, Taipei, Tokyo and Singapore), funded as part of Budget 2018’s commitment to strengthen Canada’s diplomatic and trade support presence in Asia. Traction in the Marketplace: You have at least a minimum viable product (MVP), along with quantifiable evidence of maturity (revenue, investment, or number of users). Product Market Fit: You can define your target audience, articulate the problem you solve, and demonstrate differentiation of your product/service. Strong & Experienced Executive Management Team: You can commit to send at least one senior member (C-level or Founder) to take part in the program and have the financial resources to cover in-market costs. Potential to Scale: You have a well thought out go-to-market plan for the CTA location along with KPIs to match. Participants are chosen in a competitive process. The Trade Commissioner Service and a panel of industry experts review the applications and decide whether applicants are eligible and a good fit for a location. If you are chosen a CTA team members will contact you. Companies must be ready to commit the time and money needed for their executives to live full time in the target location. For more information on how to apply, visit the CTA website. How can a multi-gas detection simulator enhance emergency response? The growth in global industry and manufacturing, together with the ever-present risk of terrorist threat, means emergency personnel are increasingly being required to respond to incidents where there is risk of exposure to explosive atmospheres, low or enriched oxygen, or the presence of lethal toxic vapours. For response crews arriving on scene there are two essential questions to consider. Is the air safe enough to breathe? And are there any specific toxic gases present? Gas detection is fundamental to emergency response – and multi-gas detectors are the ideal tools for serving the majority of first responders’ gas detection needs. Ensuring that crews have access to the right air-monitoring equipment, and that they’re trained in how to use it, is essential for enabling them to make confident decisions in complex scenarios. In this blog post we provide an overview of the most common types of air-monitoring equipment. And we explore how gas detection simulators can aid in the effectiveness of first response training. Catalytic combustion sensors – in which a heated wire is used to detect a wide variety of flammable gases from natural gas leaks to gasoline spills. In catalytic combustion, power is applied to a special wire coil, in much the same way as a traditional light bulb. Any combustible gas that is exposed to the sensor will react on the wire surface and produce a display reading. Electrochemical toxic gas sensors – which are used to detect the presence of toxic hazards. An electrochemical sensor is similar in design to a small battery except that the chemical component that is required to produce the electric current is not present in the sensor cell. As the target gas diffuses into the membrane of the sensor, this reacts with chemicals on the sensing electrode to produce an electrical current. Infrared detectors – commonly used to detect gases that are less reactive and therefore cannot be detected using typical electrochemical cells (such as CO2 or hydrocarbons). Instead of relying on a chemical reaction, infrared sensors determine the amount of gas present by measuring how much light the specific gas absorbs. Photoionization detectors (PID) – which are used to detect volatile industrial compounds (VOCs) such as methane which can be present during industrial spills. PIDs rely on the specific chemical properties of the VOCs, but instead of absorbing light they use a light source in the UV spectrum to ionize electrons off gas molecules. The last decade has seen an increasing demand for advanced training tools to create the highest levels of realism, to reinforce instruction and to enhance student learning. The use of intelligent simulation technology for chemical warfare agent training is well established. And now that same pool of knowledge and expertise has been applied to training in multi-gas detection. One such example is Argon Electronics’ Multi-Gas SIM – an App-based simulator that provides instructors with the ability to set up complex multi-gas training scenarios using an android phone. The simulator is highly configurable which means instructors can set the number of gas sensors they they want their students to view and they can select the type of sensor (be it infrared, electrochemical, PID etc). They can also program the alarm settings in accordance with the operational detectors in use – so as students move around the training environment, their display readings will adjust to simulate events such as a breached alarm. The option of an instructor remote means that trainers can remotely monitor student readings and activity, to further stimulate discussion and reinforce knowledge. For those wanting to implement large-scale releases, the multi-gas simulator can also be used with Argon’s PlumeSM system to provide an enhanced level of realism and a more focused training experience. Realism, repeatability, safety and efficiency are all key to effective HazMat training. Simulator detectors tools such as Argon’s Multi-Gas SIM promise to play an invaluable role in aiding trainees’ understanding of gas detection to ensure the right decisions are made, however challenging the scenario. Steven Pike is the Founder and Managing Director of Argon Electronics, a leader in the development and manufacture of Chemical, Biological, Radiological and Nuclear (CBRN) and hazardous material (HazMat) detector simulators. He is interested in liaising with CBRN professionals and detector manufacturers to develop training simulators as well as CBRN trainers and exercise planners to enhance their capability and improve the quality of CBRN and Hazmat training. http://hazmatmag.com/wp-content/uploads/2019/03/multi-gas-detection-simulator.png 403 806 hazzmatt1 http://hazmatmag.com/wp-content/uploads/2017/01/hazmat-logo.jpg hazzmatt12019-03-11 08:39:452019-03-12 11:47:34How can a multi-gas detection simulator enhance emergency response? Three-dimensional (3D) modeling technology is used by geologists and engineers in the economic and infrastructure industries to help organize and visualize large amounts of data collected from fieldwork investigations. In the oil and gas industry, petroleum geologists use 3D models to visualize complex geologic features in the subsurface in order to find structural traps for oil and natural gas reserves. In the construction industry, engineers use 3D maps and models to help predict the mechanics of the soil and the strength of bedrock for construction projects. In the mining industry, economic geologists use high resolution 3D models to estimate the value of naturally occurring ore deposits, like gold, copper, and platinum, in a practice known as resource modeling. All of the models are built in almost the same exact way: 1) By collecting and analyzing soil samples and/or rock cores; 2) Using a computer program to statistically analyze the resulting data to create hundreds or even thousands of new (or inferred) data points; and 3) Visualizing the actual and inferred data to create a detailed picture of the ground or subsurface in three dimensions. These models can be used in the economic and infrastructure industries to help predict the best locations to install an oil or gas well, predict the size of an oil or natural gas reserve, assist in the design of a road, tunnel, or landfill, calculate the amount of overburden material needing to be excavated, or help to predict the economic viability of a subsurface exploration project. However, because of the significant amount of computing power needed to create the models, usage of the technology by regulatory driven industries has been limited. But continuing technological advancements have recently made 3D modeling technology more accessible and affordable for these regulatory driven industries, including the environmental investigation and remediation industry. Complex 3D models that previously may have taken several days to create using expensive high-end computers, can now be made in several hours (or even minutes) using the technology present in most commercially available desktops. Because of these advancements, subsurface contamination caused by chemical spills can be visualized and modeled in 3D by environmental geologists at a reasonable price and even in near real-time. 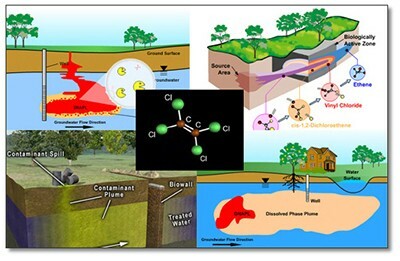 Some of the applications of 3D modeling technology in the environmental investigation and remediation industry are only just beginning to be utilized, but they have already helped to: 1) Identify data gaps from subsurface investigations, 2) Describe and depict the relationship between the geologic setting of a site and underground migration of a contaminant, and 3) Provide a more accurate estimate of the amount of contamination in the subsurface. The models have also helped contractors design more efficient remediation systems, assisted governmental regulators in decision making, and aided the legal industry by explaining complex geologic concepts to the non-scientific community. This is especially true when short animations are created using the models, which can show the data at multiple angles and perspectives – revealing complexities in the subsurface that static two-dimensional images never could. 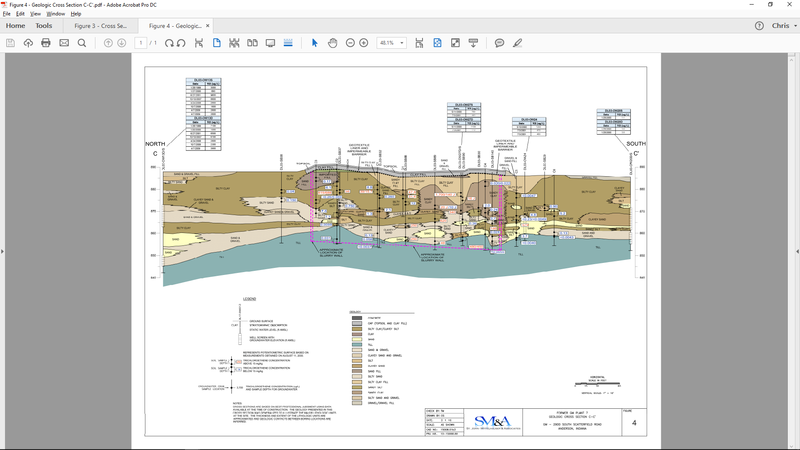 The project was resubmitted to the remediation contractors with the 3D models and animation included, resulting in a guaranteed fixed-price bid of $3.1 million dollars – a cost savings of over $1.1 million dollars for the client. Additionally, an animation showing both the remedial design plan and confirmatory sampling plan was created and presented to the United States Environmental Protection Agency (the regulatory agency reviewing the project) and was approved without any modifications. To date, the remediation system has removed over 4,200 pounds of TCE from the subsurface and completion of the project is expected in 2019. A short animation of the 3D model can be viewed on YouTube. The 3D modeling software has also been used to help determine the most cost-effective solution for other remediation projects, and has been able to identify (and clearly present) the sources of chemical spills. The following link is an animation showing three case studies involving spills of perchloroethene (a common industrial solvent) at a chemical storage facility, ink manufacturer, and former dry cleaner: https://www.youtube.com/watch?v=0IlN_TIXkGk. The most cost-effective remediation option was different for each site and was based on the magnitude of the contamination, maximum depth of contaminated soil, geologic setting, and the 3D modeled extent of contamination. Specifically, the contamination at the chemical storage facility was treated using electrical resistance heating technology, chemical oxidants were used to treat the soils at the ink manufacturer, and soil vapor extraction technology was used at the dry cleaner. However, several barriers remain which prevent the wide-spread use of 3D modeling technology. The various modeling programs can cost upwards of $20,000, as well as yearly fees for software maintenance. There are also costs to organize large datasets, build the necessary files, and create the models and animations. It also must be noted that the 3D models are only statistical predictions of site conditions based on the available data, and the accuracy of the models is wholly dependent on the quantity, and more importantly, the quality of the data. Even so, 3D modeling technology has proven to play an important role in the environmental remediation industry by helping project managers to understand their sites more thoroughly. It has also provided a way to disseminate large amounts information to contractors, regulators, and the general public. But, perhaps, most-importantly, it has saved money for clients. Matt Lyter (Senior Staff Geologist at St-John-Mitterhauser & Associate, A Terracon Company) provides clients with a wide range of environmental consulting services (Environmental litigation support; acquisition and transaction support; site specific risk assessment, etc. ), conventional and state-of-the-art environmental Investigation services, and traditional to advanced environmental remediation services. A report issued by BCC Research provides an overview of the global markets and technologies of the bioremediation industry. The report predicts that the global bioremediation market should grow from $91.0 billion in 2018 to $186.3 billion by 2023, increasing at a compound annual growth rate (CAGR) of 15.4% from 2018 through 2023. One of the finding of the report is that the application of bioremediation technology in the water bodies sector held the largest market share in 2017, and it is expected to remain the market leader throughout the forecast period. The report predicts an ever-increasing use of bioremediation techniques for treating sewage, lakes, rivers and streams, ponds and aqua culture is anticipated to create huge growth opportunities for the market in the coming years. In recent years, however, the rise in the agriculture industries has augmented the growth of hazardous pollutants in the environment, and thus the application of bioremediation methods in the agricultural sector is expected to be the fastest-growing segment. By type: In situ and ex situ bioremediation. By application: Water bodies, mining, oil and gas, agriculture, automotive and other industries. By region: North America is segmented into the U.S., Canada and Mexico; Europe is segmented into the U.K., Germany, France, Russia and Rest of Europe; the Asia-Pacific region is segmented into Japan, India, China and Rest of Asia-Pacific; and the Rest of the World (ROW) covers Latin America, Middle East and Africa. The report provides estimated values used are based on manufacturers’ total revenues. Projected and forecast revenue values are in constant U.S. dollars unadjusted for inflation. This report also includes a patent analysis and a listing of company profiles for key players in the bioremediation market. In 2014, a team of United Kingdom researchers at University of Nottingham and Heriot-Watt University issued the results of a global survey on the use of bioremediation technologies for addressing environmental pollution problems. The findings of the survey were quite interesting. One of the findings of the UK survey was the difference between the preferred vs. actual treatment method. More than half of respondents (51%) stated that they would prefer to use environmentally friendly approaches including microbial remediation (35%) and phytoremediation (16%). However, historical information suggests the opposite has actually been the case. Considering the relative low cost and low energy requirements of bioremediation technologies, the gulf between aspiration and practice might be due to various factors involving the risk-averse nature of the contaminated-land industry, or difficulties in project design. The latter include identifying appropriate organisms for removing specified contaminants, optimizing environmental conditions for their action, ascertaining extents of eventual clean-up, and the incomplete understanding of all the mechanisms and processes involved. These lead to difficulties in modeling, simulating and/or controlling these processes for improved outcomes. 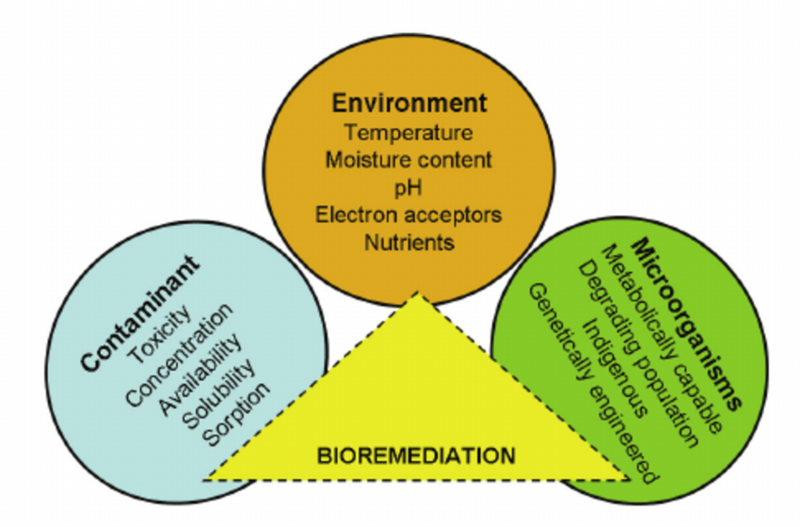 The Figure below compares the broad bioremediation methods being employed within industry according to the 2014 survey, namely monitored natural attenuation (MNA), bio-augmentation and bio-stimulation. The use of low-cost in situ technologies (like MNA) featured quite prominently, particularly in North America and Europe, where it accounts for over 60% of the bioremediation methods being used. This finding points to a strong concern within the developed countries for better maintenance of ecological balance and preventing a disruption of naturally occurring populations. Graphs of broad remediation methods used. All figures are expressed as the percentage of respondents in each category whose totals are shown in parenthesis. MNA has been shown to require 1) elaborate modeling, 2) evaluation of contaminant degradation rates and pathways, and 3) a prediction of contaminant concentrations at migration distances and time points downstream of exposure points. This is to determine which natural processes will reduce contaminant concentrations below risk levels before potential courses of exposure are completed, and to confirm that degradation is proceeding at rates consistent with clean-up objectives. These results appear to suggest that regions which employ computational and modeling resources are better able to use low-cost bioremediation technologies like MNA, whereas the others tend to use the more traditional and less cost-effective technologies. In all the continents, researchers were found to favor the use of bio-stimulation methods. Less disruption of ecological balance is apparently a global concern. Bioremediation is a method that uses naturally occurring microorganisms such as bacteria, fungi and yeast to degrade or break down hazardous substances into non-toxic or less-toxic substances.Microorganisms eat and digest organic substances for energy and nutrients. There are certain microorganisms that can dissolve organic substances such as solvents or fuels that are hazardous to the environment.These microorganisms degrade the organic contaminants into less-toxic products, mainly water and carbon dioxide. The microorganisms must be healthy and active for this to occur. Bioremediation technology helps microorganisms grow and boosts microbial population by generating optimum environmental conditions. The particular bioremediation technology utilized is determined by various factors, including the site conditions, the presence of type of microorganisms, and the toxicity and quantity of contaminant chemicals. Bioremediation takes place under anaerobic and aerobic conditions.In the case of aerobic conditions, microorganisms utilize the amount of oxygen present in atmosphere to function. With a sufficient amount of oxygen, microorganisms transform organic contaminants into water and carbon dioxide. Anaerobic conditions help biological activity in which oxygen is not present so that the microorganisms degrade chemical compounds present in the soil to release the required amount of energy. Bioremediation technology is used to clean up contaminated water and soil.There are two main types of bioremediation: in situ and ex situ. The in situ bioremediation process treats the contaminated groundwater or soil in the location where it is found. The ex situ process requires the pumping of groundwater or the excavation of contaminated soil before it can be treated. In situ bioremediation type is typically segmented as phytoremediation, bioventing, bioleaching, bioslurping, biostimulation and bioaugmentation. The ex situ bioremediation type is typically segmented as composting, controlled solid-phase treatment and slurry-phase biological treatment. Biodegradation is a cost-effective natural process that is useful for the treatment of organic wastes.The extent of biodegradation is greatly dependent upon the initial concentrations and toxicity of the contaminants, the properties of the contaminated soil, their biodegradability and the specific treatmentsystem selected. In biodegradation treatment, the targeted contaminants are semi-volatile and nonhalogenated volatile organics and fuels. The benefits of bioremediation, however, are limited at sites with highly chlorinated organics and high concentrations of metals, as they may be harmful to the microorganisms. Research and Markets recently published a research report entitled The Global Conventional and Rapid Environmental Testing market outlook report. The report covers from 2019 to 2025 and is a comprehensive work on Conventional and Rapid Environmental Testing industry. This research report provides complete insight into the penetration of Conventional and Rapid Environmental Testing across applications worldwide. Emphasis is given on the market drivers, restraints and potential growth opportunities. Detailed strategic analysis review of the Conventional and Rapid Environmental Testing market together with Porter’s five forces analysis is provided for global Conventional and Rapid Environmental Testing market. The report assesses the 2018 market size in terms of market revenues based on the average prices of Conventional and Rapid Environmental Testing products worldwide. The report also presents a 6-year outlook on the basis of anticipated growth rates (CAGR) for different types of Conventional and Rapid Environmental Testing and the industry as a whole. 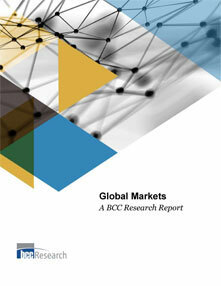 Further, detailed pricing analysis of products is provided in the report. The research work also explores how Conventional and Rapid Environmental Testing manufacturers are adapting to the changing market conditions through key market strategies. Further, company to company comparison (Company benchmarking) and Conventional and Rapid Environmental Testing product-to-product comparison (Product benchmarking) are included in the research work. Business, SWOT and financial Profiles of five leading companies in global Conventional and Rapid Environmental Testing market are included in the report. A 2018 market report on the environmental testing industry by Esticast Research & Consulting predict a CAGR 6.6% during the forecast period of 2018 to 2025. The report also states that the market for environmental testing appears fragmented and fiercely competitive due to many large and small players churning the competition in the market. Through the strategic partnership, acquisition, expansion, product & technology launch, and collaboration, these players try to gain a competitive edge. The Esticast market report states that one driver behind the growth of the environmental testing market is the surging trend of health consciousness among the people. In addition, government authorities are posing strict regulations regarding environmental protection, with an aim to survive in a healthy environment. The report also predicts that environmental testing market to offer lucrative opportunities to the existing and new market players due to the privatization of environmental testing services. A few of the major players in the environmental testing marketing include Eurofins Scientific SE, Suburban Testing Labs, Agilent Technologies Inc., SCS Global Services, Bureau Veritas S.A., SYNLAB, R J Hill Laboratories Limited, TÜV SÜD, ALS Limited, Intertek, and Pace Analytical.